Help for overweight children. Help during pregnancy. This package is designed for loving and concerned parents. Over the years, we have heard from countless loving parents seeking advice on how to share the foundational Christian principles of The Weigh Down Workshop with their children. It might seem like an overwhelming task to fight overweight, obesity and eating disorders for yourself, much less for your children. We do not want to raise our children to bow down to the false idol of food. But here is the good news: God has given us everything we need for life and godliness! The written material, 1- DVD lesson, and 3 CDs contain many helpful suggestions and heart lessons that will help you experience this independence from food and enable you to pass this freedom down to your children and grandchildren. It is also exciting to find that children pick up on these simple truths more quickly than we as adults do. Children are so capable of a single focus and are eager for true love! Not only is it our belief that the next generation is going to come to the Father in a mighty way and with loving hearts, but we also believe that it will be the children who will lead many of the adults into wholehearted devotion. This info helped me and my friends tremendously when we were having our pregnancies. I fully support all that is taught in this and have recommended this tool to all of my dearest friends. This is a great resource! I started listening to these CDs during my first pregnancy. I'm so thankful for the truth, wisdom and freedom taught. I applied Weigh Down through all 4 pregnancies and had beautiful healthy babies and lost the weight quickly after. Weigh Down truly is the answer!!! from Franklin A Must for Every Parent! Oh how I wished I had these CD's when I was pregnant 20 years ago. Even though my children are now in their teens, I have found this information so essential to correct years of misdirected parenting. I passed my food idol down to my children, and through this message I learned that I had to change if I wanted to ever see my children change. You will learn so much in this series including: if your eyes light up over the food, your kids will notice. It has to start with you as a parent. 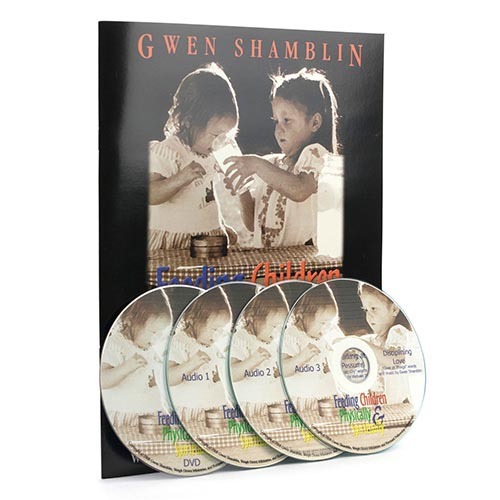 My favorite CD in this series is "Barking at Possums" - you will love it and fall in love with God through Gwen all over again! What's a mother to do without this information? This is timeless and essential for everyone even considering pregnancy. How I wish I had this information 30 years ago! So thankful to have it now and to pass on to my children and grandchildren.